"I went to Westgate shopping centre initially only to withdraw some cash, as it's the only place around with cash machines, but once there we decided to do some shopping too. Shortly after leaving, we heard about the attack - which has so far claimed 59 victims - and we were completely shocked because some of our friends (now released) were being held hostage in the building." "Even though everybody in town knows the building it's a likely terrorist target because of its Israeli ownership - that's why they employ 50 ill-equipped around-the-clock security guards, paid roughly £100 a month - it all came as a surprise, especially because there's never been any direct attack on Kenyans as big and organized as this one before." "Yes there have been some small-scale terrorist attacks in the past, it all began when Kenyan troops occupied some Somali territories back in 2011 and militant Somali Islamic groups started retaliating. There were a couple of incidents on the streets of Nairobi involving home-made grenades, but this has taken things on a whole new level." 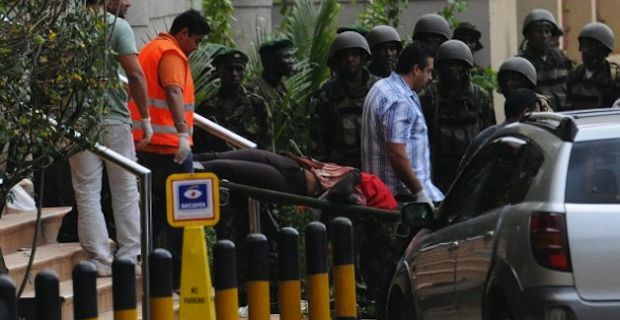 "At the Westgate shopping centre, the al-Shabab gunmen bursted in during a children cooking contest, shooting everyone regardless of their religion or the fact that there were a lot of pregnant women and children around. Once the initial killing spree was over, they asked the survivors if any of them was of Muslim religion. The ones who replied affirmatively were asked to recite an Islamic prayer - with those who failed immediately killed on the spot." "Some of the terrorists have already left the mall disguised as traumatized shoppers after changing into some new clothes grabbed from the shops. Initially there were 30 gunmen, I don't know how many of them are still in the building now but I know that they still have both the top floor - where the children party was being held - and the basement, with many people still being held hostage." "Kenyan troops have now launched a major counterattack and I hope they will catch some of the terrorists alive (which is quite unlikely, keeping in mind that here they often kill people for much less, such as for stealing) so at least they could somehow answer for the crimes they have committed. At the same time, we need to deeply think about the consequences of getting involved in foreign internal affairs, is it right for troops to interfere if the intervention is most likely to cause even more despair, with people left to fend for themselves on the long run?"